A cavity of air with an opening will resonate at a natural frequency when the air is excited - a phenomenon known and exploited for thousands of years to make musical instruments. The German physicist Hermann von Helmholtz (1821-1894) established the relationship of the resonate frequency to the volume of the cavity and size of the port, hence, the Helmholtz resonator (Figure 1). The Helmholtz resonator is commonly applied to musical instruments but is also found as automobile mufflers and subwoofers. and is the effective length of the port, which is L+1.5r (in) where L is the actual length and r is the port radius (circular port). Once the constant C is determined, the resonance frequency of a cavity is easily calculated based on the volume of the cavity. Or in other words, the resonance frequency varies linearly with the inverse square root of volume (a convenient relationship). So, now that the math is done the fun part can start. The sound generated when the air cavity resonates is caused by the air vibrating, which also causes the walls of the cavity to vibrate. The cavity vibration is detectable by a sensitive accelerometer, such as the GCDC X6-2 or X6-1A devices. A Fast Fourier Transform (FFT) analysis of the accelerometer data provides the frequency spectrum of the resonating cavity. Plotting the frequency spectrum illustrates all the frequencies present and also indicates the dominant frequency, or resonance frequency, of the cavity. 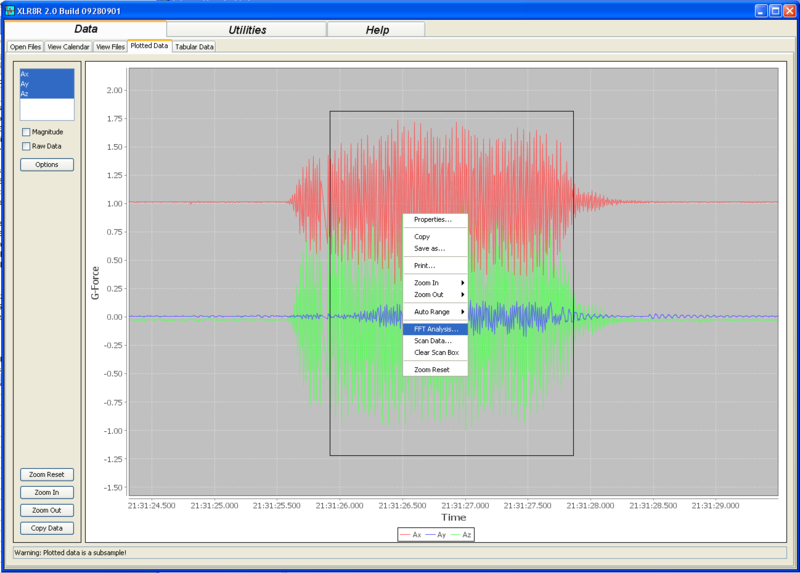 This experiment uses a GCDC X6-2 accelerometer and the FFT function included with the XLR8R Java application to illustrate the relationship of the resonance frequency to the cavity volume of a Helmholtz resonator. 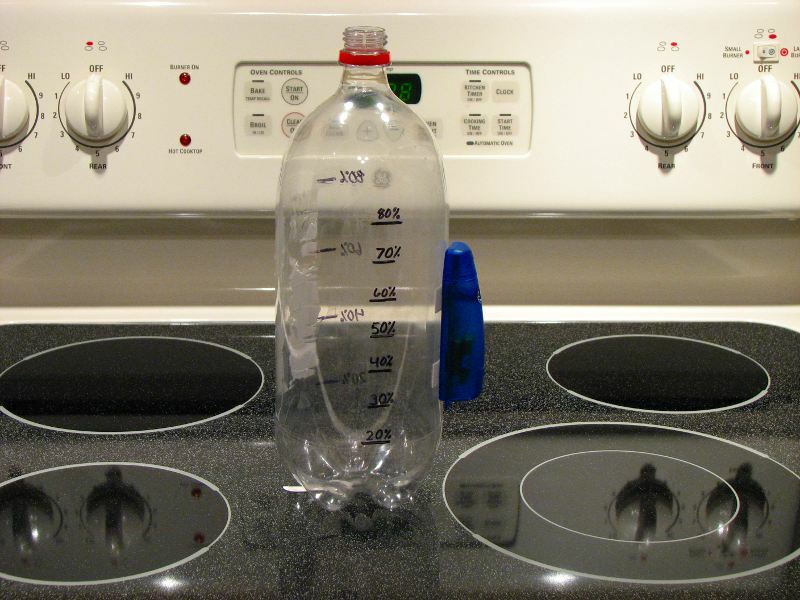 For this test, the Helmholtz resonator is a simple 2 liter plastic drink bottle (Figure 2). 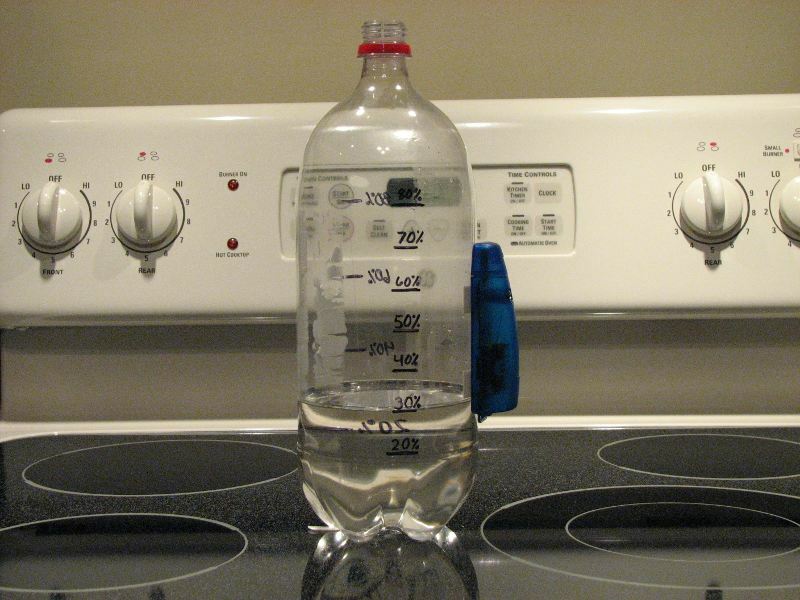 The volume of the bottle was measured to be 137.6 cubic inches (larger than 2 liters because there is an air gap included with the bottled product). The bottle was marked with fill marks at 10% volume intervals starting at 20%. 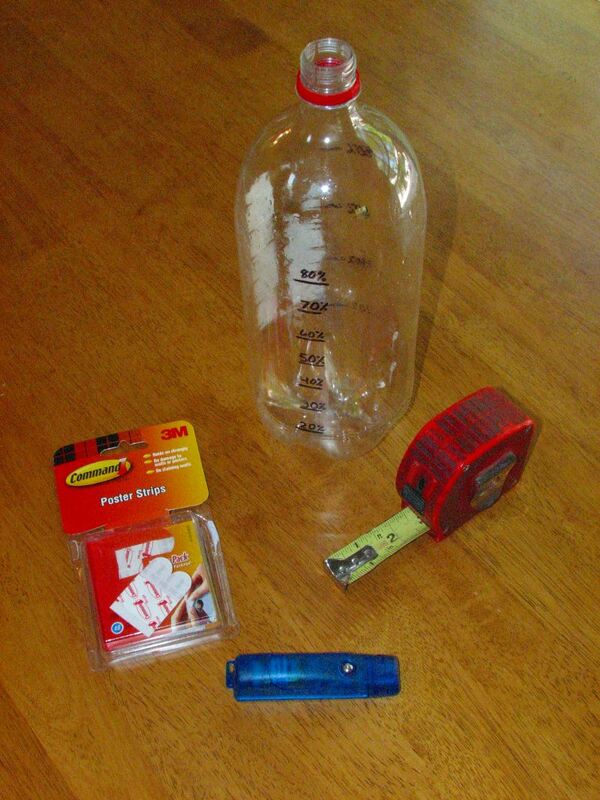 The X6-2 accelerometer was mounted at the midpoint of the bottle using 3M Command Poster Strips (Figure 3). The device was configured to sample at 320Hz, high gain, no deadband limit, and 100,000 lines per file. The X6-2 was started once and logged the entire set of tests (instead of turning on/off for each test run). The bottle port opening was measured 0.850 inch in diameter and the length approximated at 1.2 inch. The port length is an approximation because the diameter begins to widen into the cavity volume. Table 1 summarizes the bottle geometry. Filling the entire bottle with water and measuring the weight of the water provided the bottle volume. One ounce of water is one fluid-ounce, or 1.8046875 cubic inches. The water weighed 4lbs-12.25oz, which means 76.25 ounces * 1.8046875 in^3/oz = 137.6 in^3. Therefore, 7.625 fluid ounces equates to 10% volume increments. The bottle was marked at 10% increments starting at 20%. Table 2 lists the volume increments as well as the level mark as measured from the base of the bottle. After turning on the X6-2, the first resonate test condition used the empty bottle. Blowing into the bottleneck with a gentle and consistent breath excited the air within the bottle. Three breaths were tried and at least 2 seconds of tonal sound was created with each try. (The empty bottle condition requires the most air to excite so take a deep breath). Next, the bottle was filled with water to the 20% mark and the test repeated with three breaths. This was repeated for the 30% and 40% marks (Figure 4). Testing beyond 40% filled is not useful (see Discussion). Once the four tests conditions completed, the X6-2 device was turned off and removed from the bottle. The data was loaded into XLR8R and plotted. The overall plot will show all the test conditions. Zooming into a particular time frame re-samples the data and provides a higher resolution plot of the test condition. Observing the three attempts for each condition, the best data set was selected based on the length and consistency of data. A "scan box" was drawn around a segment of data at least 1 second long (Figure 5). Occasionally, a gap in the data occurred as the microSD memory card was unable to maintain the data throughput. Try to avoid these regions. 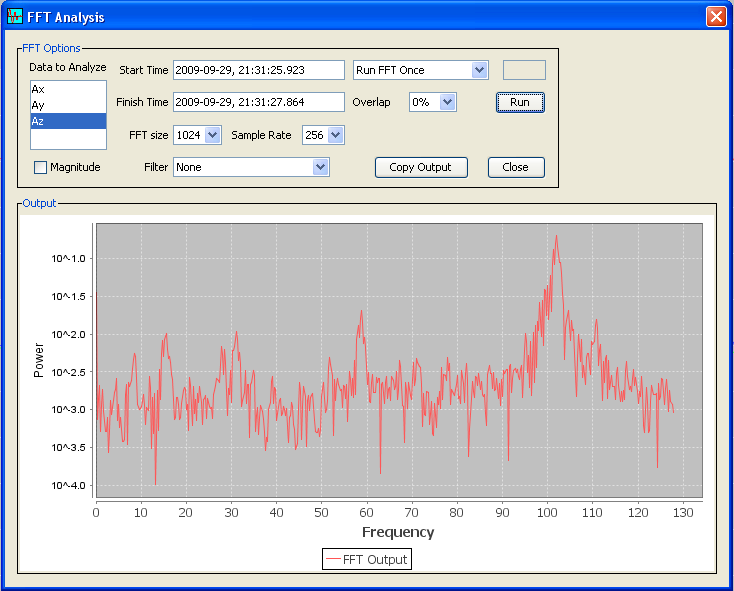 The FFT Analysis function of XLR8R calculates the frequency spectrum of the selected data set. The FFT analysis was configured to 256 hertz sample rate, 1024 sample size, and used the z-axis data (Figure 6). The bottle vibrated the most in the radial direction. Therefore, the z-axis captured the best signal. You may notice that certain frequencies vibrated greater in the x-axis. Each of the four test conditions were analyzed similarly and the four spectral graphs were combined into one plot using a spreadsheet. Frequency spectrum plots for each test condition is illustrated in Figure 7. The highest peak in each frequency spectrum graph was chosen as the resonance frequency. The four resonance frequencies were plotted against the inverse square root of volume (Figure 8). A linear trend line and equation were added to the plot to illustrate the accuracy of the relationship. The following table compares the theoretical frequencies to the measured frequencies. The theoretical resonance frequency for test 4 indicates that the X6-2 sample rate was insufficient at capturing the actual resonance of the bottle. The 125.8Hz measured was the highest dominant frequency within the range of the FFT output capability. Adjusting test 4 to 35% fill level would have been appropriate considering the limitations of the X6-2 and the FFT algorithm. Ideally, the scale factor of the linear fit should equal the calculated geometric constant (C). 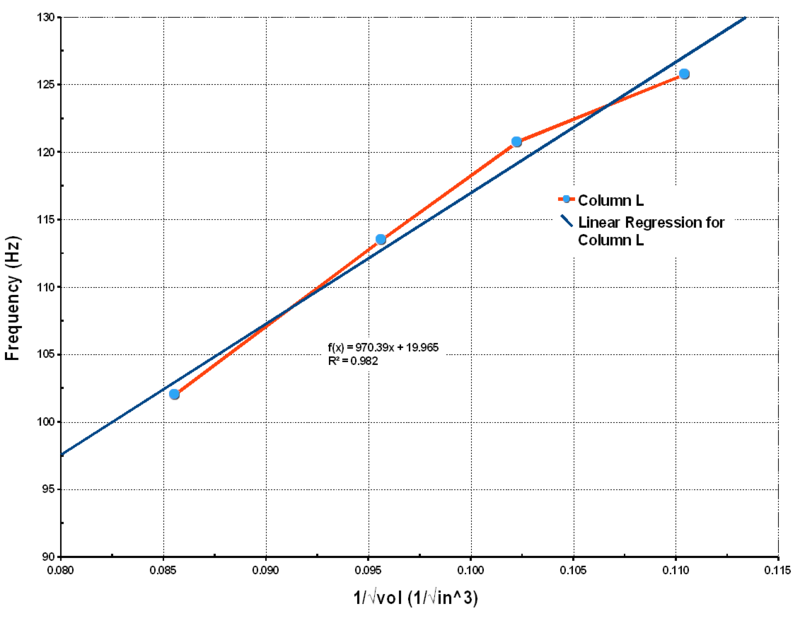 Removing the results of test 4 from the analysis provides a very good linear correlation and a scale factor of 1124.3. The GCDC X6-2 USB accelerometer data logger captured the vibration of a resonating cavity and provided sufficient data to determine the dominant frequency. The precision timing of the X6-2 resulted in very accurate measurement of the resonance frequency, which was used to demonstrate the Helmholtz equation for resonating cavities. One of the most common applications of the Helmholtz resonator is probably sitting next to your computer. 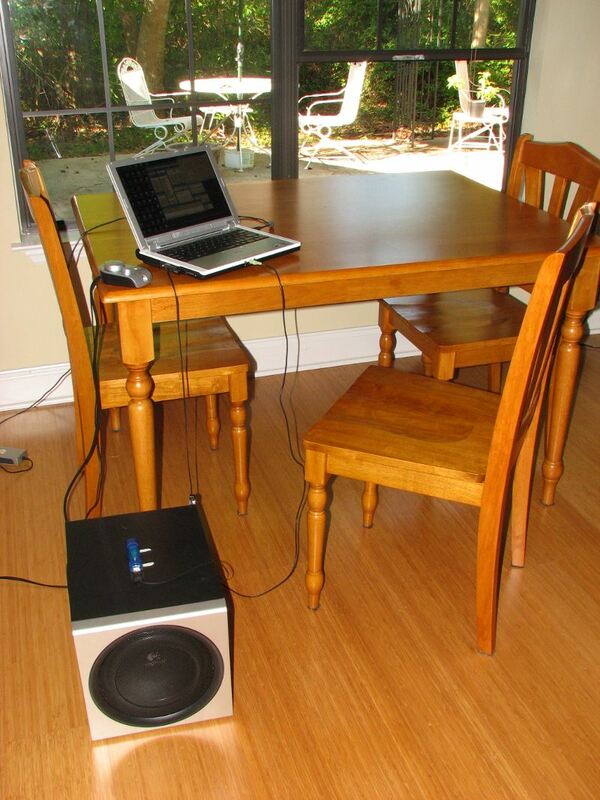 Many speaker systems incorporate a ported enclosure to help replicate base frequencies. The ported enclosure is designed such that a particular resonance frequency enhances the ability of the speaker to replicate a range of frequencies. For example, the Bose satellite speaker system incorporates a patented subwoofer design using two ported enclosures to broaden the effectiveness of the speaker. 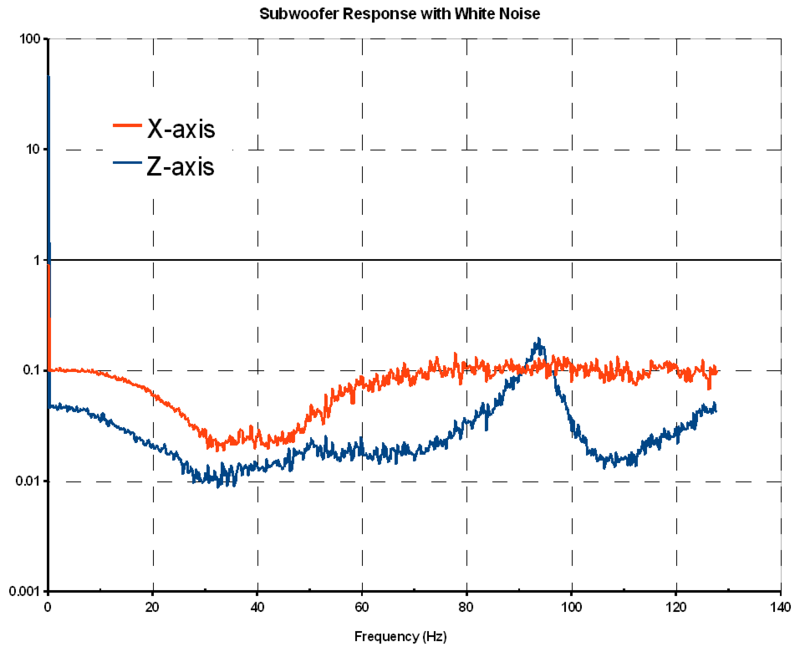 The subwoofer enclosure of a Logitech Z-2300 computer speaker system was evaluated using a GCDC X6-2 accelerometer data logger. The X6-2 was mounted to the exterior surface of the subwoofer using 3M Command Poster Strips and configured to sample at 320 hertz, high gain. The x-axis was oriented in line with the speaker voice coil travel (Figure 9). White noise, which is a random sound signal with a flat spectral power, was played through the subwoofer for one minute while the data logger recorded the vibration of the enclosure. The resulting data was processed through the XLR8R FFT function to generate a spectral plot. The analysis results of the x and z axes are illustrated in Figure 10. The subwoofer enclosure vibrated primarily in the z-axis. The x-axis captured the motion of the speaker voice coil, which provided a different frequency response than the enclosure. 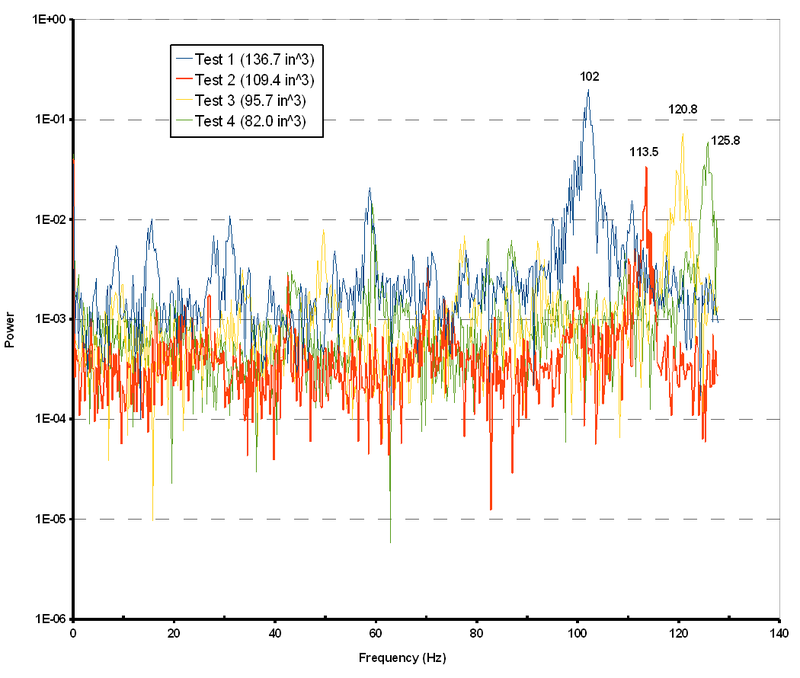 The x-axis data clearly shows the lower frequency capability of the speaker (note the distinct drop in power below 60 hertz). The z-axis data shows the resonance frequency of the enclosure at 94 hertz. Notice that in the bottle test and the subwoofer test that the air cavity produced a broad range of sound frequencies centered about the resonance. The range of frequencies depends on the cavity and port geometries. In the case of the Logitech subwoofer, centering the resonance frequency about 50 Hz would provide better speaker performance by amplifying the lower attenuated base frequencies. The 94 Hz resonance creates more "boom" but doesn't properly replicate music. On the other hand, a subwoofer enclosure resonating at 50 Hz would be much larger, more expensive to build, and heavier to ship. Logitech compromised an ideal speaker system with the consumer's demand for an economical product that creates a booming base.